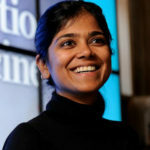 Saria was chosen for her work on computer-based approaches to develop diagnoses and treatments more specific to individual patients, including for septic shock, blamed in 20 to 30 percent of all U.S. hospital deaths. By creating algorithms to analyze existing medical information, Saria’s work “suggests that the best answers might already be out there; they just need to be decoded,” Popular Science wrote in announcing the 15th annual Brilliant 10. The announcement was posted online today. “I feel lucky to be at a place like Johns Hopkins where I have the privilege of working with some of the brightest students and collaborators,” said Saria, 33, assistant professor in the Whiting School of Engineering’s Department of Computer Science. She also holds a joint appointment in the Department of Health Policy and Management at the Bloomberg School of Public Health, and in Applied Math and Statistics at Whiting. T.E. Schlesinger, the Benjamin T. Rome Dean of the Whiting School of Engineering, acknowledged Saria’s groundbreaking work. For instance, she said, in sepsis—a syndrome that develops as a reaction to infection—fluids are often given to stabilize a patient. But, while some patients are helped by fluids, others respond negatively and develop complications. If computer algorithms can predict this, it can help doctors refine their treatment strategy. They can ask “what-if” questions – what would the likely outcome be if the patient were given more fluids versus more drugs to constrict blood vessels, another treatment for sepsis. Saria’s algorithms have proven effective in spotting health risks in premature newborns. She is also using this strategy to create more precise prognosis tools for autoimmune diseases such as scleroderma and lupus. Her recent published research has focused on saving patients from septic shock, which kills more Americans every year than AIDS and breast and prostate cancer combined. It’s crucial to identify those likely to develop septic shock as soon as possible: every hour that treatment is delayed raises the risk of death by 7 to 8 percent. Last year Saria led a team including Johns Hopkins scientists Katharine Henry, a doctoral student in computer science and Dr. David Hager, critical care specialist, in creating a computer algorithm to identify patients at risk of septic shock. The approach allows clinicians to take action early to prevent organ failure. The algorithm correctly predicted septic shock in 85 percent of cases, without increasing the false positive rate from screening methods that are common now. More than two-thirds of the time, the method was able to predict septic shock before any organ dysfunction. That’s a stunning 60 percent improvement over existing screening protocols. The algorithm combines 27 factors into a Targeted Real-time Early Warning Score –TREWScore – measuring the risk of an infection developing into septic shock. The algorithm was based on information from the electronic health records of 16,234 patients admitted to intensive care units at Boston’s Beth Israel Deaconess Medical Center from 2001 to 2007. The algorithm has also been validated on data from patients admitted to the Howard County Hospital. The “real life” impact of this work is so enormous that Johns Hopkins is now piloting a real-time surveillance tool using this method at the Howard County General Hospital. Other health care systems are pursuing ways to use the algorithm as well. In order to arrive at the Brilliant 10, Popular Science pours over hundreds of nominations from around the country and vets the most promising candidates with experts working in those fields.